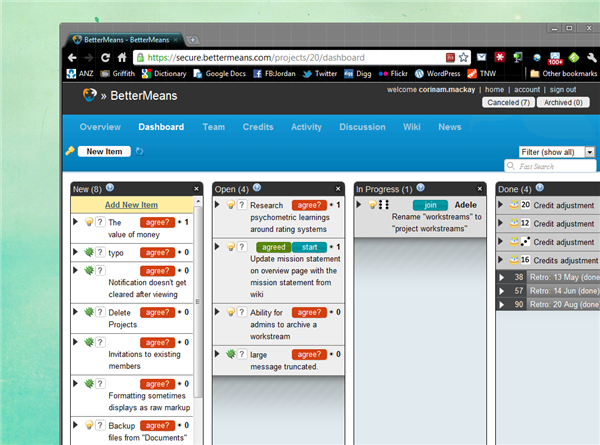 Better Means is an innovative project management platform promoting transparency and equality among companies. Basing the platform on a system of equality, Better Means allows teams to collaborate on projects in a fair, honest environment. A democratic voting system ensures everyone who wants to contribute to a project is able to have their voice heard. Contributors outside of the core team can also vote and comment on projects, allowing the wider community opinion to be heard, whilst not affecting the progression of projects. The options available for companies really make this a flexible platform. Adele mentions the optional credits system in the second video I’ve included, which is a democratic way for team members to vote on compensation amounts for those who contribute to a project. Companies who want to control compensation in their own way can simply ignore this feature. Interstate: Project roadmaps, done exceptionally well. And while the team at Better Means promotes openness and transparency, private options are available as well. For companies who are happy to keep all projects and members completely public, signing up is free, but for those wanting private options, pricing varies from $25 to $200 per month, depending on how many private workstreams and members you need. For groups interesting in testing the waters of openness and transparency (or those already doing so), this is a great way to promote collaborate, democratic decision making and cut out the traditional hierarchy of business. Sign up here to test it out. Read next: London to take on Silicon Valley with major investment, but can it transplant the culture?